A little while ago, I overheard a conversation between two people about holiday shopping. They were lamenting the running around and deciding what to get and how much they were spending and THEN getting it all wrapped up and ready to go. One of them commented at the end of the conversation, “It really almost ruins Christmas, you know?” The other person solemnly agreed. I was left speechless. I know it’s likely that they weren’t even considering the words they used, and technically they did say “almost”. However, those of you who’ve read more than a few of my posts know that I regular comment about the words we choose to use. In this case, maybe the words don’t directly affect the health and well-being of the person using them, but then again, maybe they do. Are they taking for granted the fact that they have time and money to run around holiday shopping for family and friends? Are they grateful for the fact that they have family and friends to shop for? Do they think about the fact that there are people out there who don’t have a festive tree set up in their homes, and who haven’t done any Christmas shopping because it’s all they can do to afford food? What “ruins” a holiday for someone, particularly Christmas? A difficult shopping schedule? Or putting away the special ornament you bought for the baby that was never born? Too many family members to buy presents for? Or wondering what to do with the gift you bought for your father who just passed away? Too much prep work for Christmas dinner? Or wondering if you’ll have anything to eat on Christmas Day? Don’t forget that other big holiday we just celebrated that maybe sometimes gets lost in perusing glossy store ads and early morning “doorbusting” shopping sprees. Once the leftovers are gone and Black Friday passes, it is still the season to be thankful. I was in the grocery store the other day, I have started going very early since I’m not overly patient with crowds and the inevitable dodging of carts and fellow shoppers and people stumbling around in some sort of shopping coma. Not particularly enlightened of me, I know. Given the right frame of mind, I can navigate crowds pretty well, but I digress. That’s a subject for another post. Now, said in one way, you might think she was just laughing it off people sometimes do, a bit of self depreciating humor. But she sounded so resigned to this fact, it was almost heartbreaking. I recall one of my favorite movies, a 2004 film called What the Bleep Do We Know! ?It can be a truly life changing film if you take the time to think about its message. And maybe, as I think back to it now, remind yourself periodically of its message. While I’ve slightly digressed again from the point of this blog, the movie itself is a helpful tool to understand what I am sharing, which is mainly the power of words. Particularly the effect your words have on yourself. How often has the woman at the grocery store said “I’m always in the way.”? Think about saying that about yourself with such resignation frequently, maybe even daily. What effect do you think that would have on you, on your psyche? How long before you truly feel that maybe you are useful for nothing except being in the way? Next, they wondered what would happen if they wrote words on paper and wrapped the paper around the bottle with the word facing in. Although it didn’t seem logical that the water would ‘read’ the word, the music experiments had led them to realize strange things could happen. They wrote “Thank You” and “Fool” on two separate samples, and the results did not disappoint. 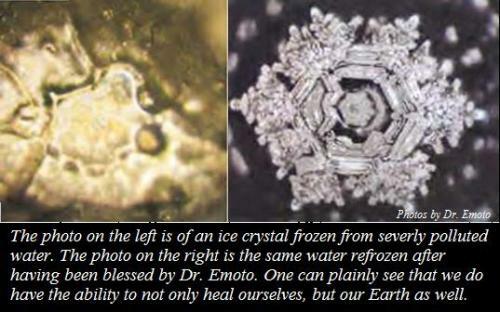 “Water exposed to “Thank you” formed beautiful hexagonal crystals but water exposed to the word “Fool” produced crystals similar to the water exposed to heavy-metal music, malformed and fragmented.” A nice synopsis of the study can be found here. It is hard, I know first hand, not to let your thoughts become the weights that drag you down. Even if you are tired, does repeated thinking, or saying “I am so tired” help you in any way? Or does it simply contribute to the energy of tiredness around you, magnify and intensify, perpetuate the tired feeling. Maybe you feel silly saying out loud “I am energetic!” But perhaps something like that, redirecting your thoughts, focusing on something other than being tired, takes away the amount of energy you put into thinking about being tired, dwelling on it, and making it real. If you are always waiting for the next bad thing to happen, it probably will. Think instead about the positive things you hope to accomplish in your life. Redirect your thoughts to those things. A significant proportion of the human body is water. While you’re not likely to freeze yourself solid and examine your ice crystals, you can imagine what they might look like if you did. What would your water crystals look like if you were constantly telling yourself that you are fat, lazy, useless… or always in the way? Imagine the toxic state we put ourselves in by not having kind words for ourselves. It applies to our physical being, it applies to our life situations. If we think all the time how tight money is, how perilously close to broke we are, how we’re always struggling to make ends meet, are we perpetuating that situation by constantly feeding energy to it? If we can change our focus to positive thoughts regarding our finances, can we change our fortunes? Years ago, we learned a little positive affirmation trick for money. Thank you, God, for a miracle involving money today. Repeat that to yourself. Then, when money comes to you, even if it’s just loose change in the couch cushions, repeat your thank you for a miracle involving money today. It works! If you find yourself in this rut of negative thoughts and feelings, stop for a moment. Stop the words. Find something nice to say about yourself, or choose a positive affirmation to repeat to yourself and change your thought pattern. I am beautiful, positive, happy and thankful that all good things flow to me.